I followed this video, but since I had different size needles I had to changed it to work with what I had. 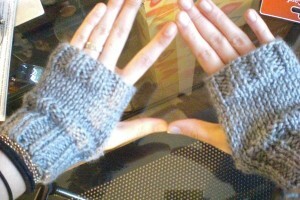 The video calls for 24 chains, but I had to cast on 32 for the finished glove to fit my hand. The more chains you cast on the bigger the glove will be. Just make sure it is an even number. After you cast on 32 chains you knit 15 rows of rib stitch, (knit 2 purl 2) then 12 rows alternating between knit and purl rows. Lastly, return to the rib stitch with 6 rows (remember you can adjust these numbers to the size of glove you want). It might take a few times to get it just right but when you figure out your numbers the finish product is great.